What are the types of Powassan virus (POW virus)? What is Powassan virus disease? What causes Powassan virus disease? What are risk factors for Powassan virus disease? Where have most incidences of Powassan virus disease occurred? What are signs and symptoms of Powassan virus disease? What tests do health care professionals use to diagnose Powassan virus disease? What is the treatment for Powassan virus disease? Are there home remedies for Powassan virus disease? What are complications of Powassan virus disease? What is the prognosis for Powassan virus disease? Is it possible to prevent Powassan virus disease? Powassan viruses are members of the genus Flavivirus; there are two types, termed lineage 1 and lineage 2. Powassan virus disease is an infection caused by these viruses that may result in a range of symptoms from none to encephalitis and death; the disease is relatively rare in the United States. Both types of Powassan viruses cause the disease; however, these viruses require a vector to transmit them to humans. The vector is a tick. The major risk factor is a tick bite from an infected tick. Most incidences of this disease in the U.S. have occurred in the northeastern and Great Lakes regions. If symptoms develop, they may include fever, headache, vomiting, weakness, confusion, loss of coordination, speech and memory problems, and seizures. Besides the patient's history and physical examination (especially the history of a tick bite), blood and spinal fluid tests are needed to diagnose this infection. There is no specific treatment for this disease; supportive care, including hospitalization, may be required for severe infections. Home remedies to prevent tick bites may help prevent the disease. Complications of Powassan virus disease may include permanent problems such as recurrent headaches, muscle wasting, and memory problems; severe infections may cause death the prognosis depends on the severity of the disease and may range from good to poor. There is no vaccine available to prevent Powassan virus disease; however, it is possible to prevent transmission of the disease to humans if tick bites are prevented. Powassan (POW) virus is a Flavivirus, a genus in the family of Arbovirus; it is related to viruses such as West Nile virus. The virus is named after Powassan, Ontario, where it was first discovered in 1958. Two types of Powassan virus have been found in North America, including lineage 1 and lineage 2 (deer tick virus) types of POW viruses. Linage 1 type is associated with Ixodes cookeri, Ixodes marxi, and Ixodes scapularis tick species, while linage 2 virus is only associated with Ixodes scapularis ticks. Unfortunately, the tick that usually bites humans and is infected is Ixodes scapularis so humans can be infected with either virus type. Powassan virus disease is a rare disease caused by a virus that is spread to humans by infected ticks. There have been approximately 75 individuals diagnosed with this disease in the United States in the last 10 years. The disease caused by the virus is an inflammation of the brain tissue (encephalitis). The cause of the disease is viral infection that leads to inflammation of the brain tissue (encephalitis). The viruses are transmitted to humans by ticks. When a tick carrying the virus feeds on a person (tick bite or blood meal), the viruses are transmitted from the tick to the human. The incubation period (time from exposure to time of symptoms) varies from about one week to one month. Mortality (death) rates for this disease very greatly in the medical literature and range from about 1%-2% to a high of 60% of cases. The risk factors include living or working in brushy or wooded areas because of the potential for exposure to ticks that are vectors of the virus. Consequently, a tick bite is a risk factor for this disease. The majority of infected individuals live in the northeastern or Great Lakes regions of the United States. Most incidences of Powassan virus disease occur in people who are exposed to brushy or wooded areas that contain ticks. In the U.S., the majority of infected individuals live in the northeastern states like Massachusetts (even in Cape Cod), New York, New Jersey, and the Great Lakes regions and became infected when ticks were most active (late spring to early fall). 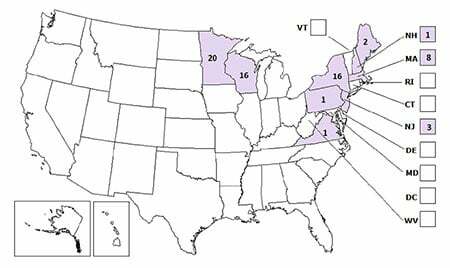 Detection of the disease is slowly occurring in other states (see Pennsylvania and Virginia on map below). Diagnosis is based on a combination of the patient's history (especially a tick bite) and physical examination along with ongoing signs and symptoms. If the disease is suspected, testing of blood and spinal fluid may detect antibodies against the Powassan virus and confirm the diagnosis. Often, an infectious disease specialist is consulted if this rare disease is suspected. Treatment for this disease is mainly supportive. It may include hospitalization, respiratory support, IV fluids, and other treatments to reduce symptoms. Unfortunately, there is no specific medicine to cure or to treat Powassan virus disease. There are no home remedies to treat this disease. However, there are home remedies to keep ticks from biting humans. No tick bites equals no disease. Home remedies that claim to keep ticks from biting are cedar oil, lemon eucalyptus oil, and rose geranium essential oil. These act as tick repellents. Survivors of severe infection (for example, encephalitis and/or seizures) may have neurological complications. Patients may have permanent problems such as recurrent headaches, muscle wasting, and memory problems. Those individuals who develop Powassan viral disease with little or no symptoms have a good to excellent prognosis. Those individuals with progressively severe disease have a decreasing prognosis and may develop lifelong complications outlined above or die. Yes, it is possible to prevent this tick-borne disease by preventing any tick bites. Unfortunately, there is no vaccine available to prevent viral infection. Consequently, the U.S. Centers for Disease Control and Prevention (CDC) has several recommendations on how to prevent tick bites. The CDC suggests using repellent that contains 20% or more DEET, picaridin, or IR3535 on exposed skin and using products that contain permethrin on clothing. Shower soon as possible after coming indoors if you have been in tick-infested areas. In addition, carefully examine children and pets for the presence of ticks. Removing a tick may prevent transmission of the virus if done appropriately and shortly after the tick has attached to the skin. United States. Centers for Disease Control and Prevention. "Powassan Virus." Feb. 14, 2017. <https://www.cdc.gov/powassan/index.html>.